NYC Bagel & Sandwich Shop is currently running nearly 300 deceptive ads on Craig’s List. 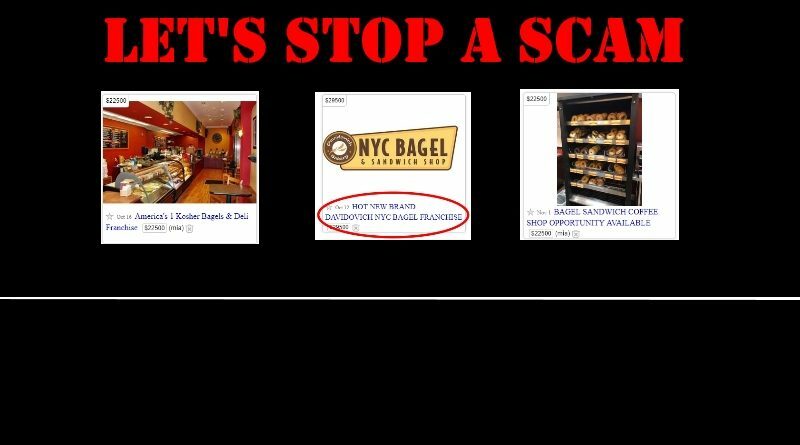 Here’s how to identify the various NYC Bagel Scam ads. Please share this link and this video and support our GoFundMe initiative so no more families and individuals get scammed. The UnhappyFranchisee.Com and NY Bagel Scam websites are dedicated to warning individuals and families about the fraudulent NYC Bagel Scam franchise being aggressively promoted on local Craig’s List sites across the country, but most heavily in NJ, PA, NC, SC, FL, OH, TX, and CO.
Victims of the NYC Bagel Scam report losses ranging from $19,500 to more than $500,00. Please post and/or forward the link to this video or the donate page to anyone who might be interested in stopping this insidious scam. The NYC Bagel Scam ads generally appear in the “For Sale – Business/Commercial – by dealer” section of Craig’s List. SEARCH TIP – USE SEARCHTEMPEST TO LOCATE NYC BAGEL SCAM ADS: SearchTempest.Com is an independent search engine that will scan for keywords across all local Craig’s List ad sites. If you search for a term like “Bagel Store” “NYC Bagel” or “$22,500” look into the regional listings for NJ, NC, FL, or TX you’ll likely see dozens of NYC Bagel & Sandwich Shop ads. ARE YOU A VICTIM OF THE NY BAGEL SCAM? SHARE YOUR EXPERIENCE OR OTHER COMMENT BELOW. ← Let’s Stop the NY Bagel Scam!